A couple weeks ago I cooked some butternut and acorn squash in my slow cooker thinking it would be delicious. I cooked it on low for about 3 hours with a sprinkle of brown sugar and about a quarter of a cup of butter (for two squash). Long story short, it wasn’t good. It was bland and mushy and we didn’t want to eat it. I tucked it into the freezer determined to find it a home somewhere. And here’s somewhere – inside some ravioli. I pureed the squash with a healthy dose of salt and pepper along with about a cup of ricotta cheese. I rolled out sheets of my homemade basil pasta dough and dropped the filling by tablespoons, about 3″ apart. I brushed an egg wash around all the drops of filling and laid a second sheet of dough on top. I carefully pressed out all the air and sealed the two sheets of dough together, then cut out the ravioli with a round biscuit cutter. The ravioli freeze beautifully when laid out on a cookie sheet, then I just gathered them all together, popped them into a plastic container, and tossed back in the freezer to be boiled on some lazy evening when I didn’t want to cook. It is really delicious, though admittedly time consuming to make originally. When I make ravioli, my kitchen looks like a pasta manufacturer blew up in there – I make as much ravioli as I possibly can at a single go and freeze for later. It’s perfect served with a drizzle of olive oil and a sprinkle of parm. 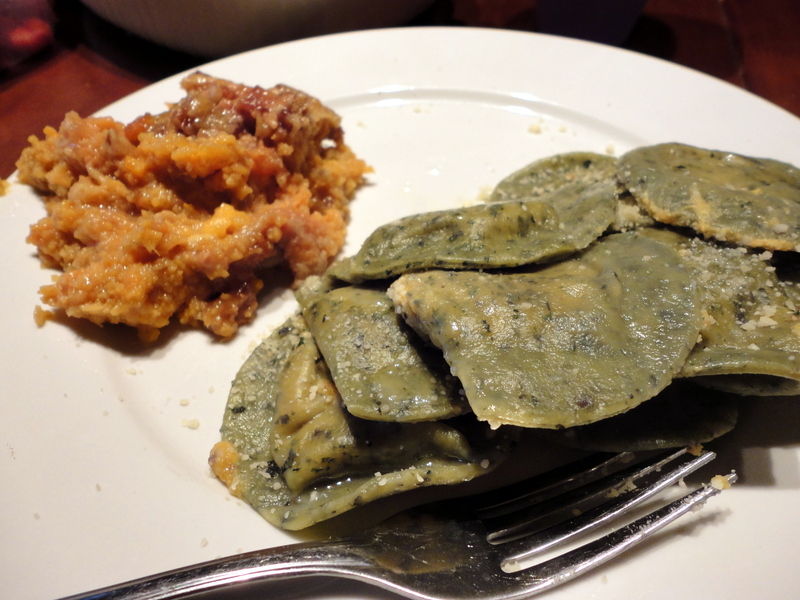 Along side that ravioli is a sweet potato casserole, the recipe for which I stole from my mother last Thanksgiving. My kid loves it, and since we got sweet potatoes in our box, I wanted to make it. The recipe originally called for much more sugar, and it was just way too sweet for everyday eating, so I’ve cut the sugar down substantially and it’s still just as good. I boiled the sweet potatoes a couple days in advance when I had a free hand to cook while the kiddo napped. I mashed them with a regular potato masher and found that I was somewhat short of the 4 cups needed for the casserole. To bridge the gap, I tossed in about 1.5 cups of pureed beets that I had in the freezer waiting for a new home. It was great. The beets blended in well and made the whole dish a beautiful pink color. I don’t think I’d recommend switching entirely to beets, but you could easily go with half beets, half potatoes and not suffer any dire consequences. Sweet Potato Casserole – now with beets! Preheat oven to 350. Combine all the ingredients above. Pour into a 2-2.5 quart casserole dish. Top with topping below. Combine sugar, flour, butter, and pecans. The easiest way to do this is with your (clean) fingers. Then sprinkle over the potato mixture detailed above. Bake at 350 for 35-45 minutes.